A silver belt plaque of rectangular form, the short sides folded over. The front of the plaque is decorated in repoussé with two deer, confronting each other and depicted in a recumbent pose on either side of a tree that bears large fruit and leaves and grows above a basin-shaped ornament. Each deer’s head is crowned by a lingzhi crest and the animal’s fur is indicated by finely incised lines. The design is set against a ground of small raised dots. The raised parts of the design are gilded. This partly gilded silver plaque was originally used as an ornament on a leather belt, possibly worn by a high-rank official. Deer are popular as a motif both in the Song (960 – 1127) and Liao dynasties, although their meanings are different. In the Song dynasty they represent Luxing, the God of rank and emolument in Chinese mythology and symbolize longevity. In this capacity, they are often found on ceramics. For the Qidan people during the Liao dynasty, deer are worshipped by Tungusic shamans and are objects for hunting. 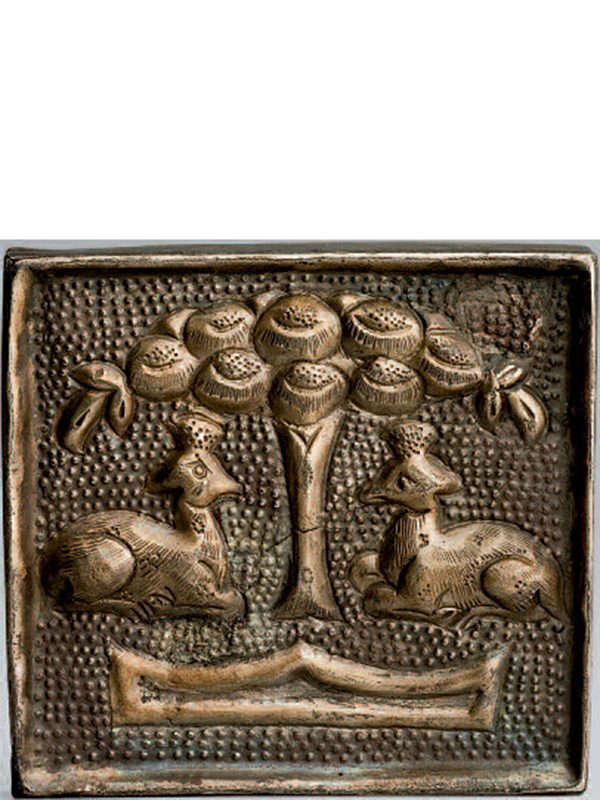 A set of gilded silver belt ornamental plaques with closely comparable deer motifs and decoration is in the Mengdiexuan Collection. Writing in Noble Risers from Pines and Deserts – The Artistic Legacy of the Qidan, So points out that a set of gilded silver ornamental plaques, each with twin deer decoration as the main motif, was excavated from a Qidan tomb at Zhangwu in Liaoning province.